Our van is an environmentaly friendly Zero Emission electric vehicle. Need a new boiler? Affordable boiler installation and combi boiler upgrades. Professional and affordable boiler service throughout the Chorley area. Full central heating systems, radiator replacement & thermostats. Booth Heating Solutions Ltd are specialists in home plumbing and heating repair and service in Chorley Lancashire. As a family run business with over 15 years expertise gained with British Gas as a heating engineer, we are able to install, service and repair all makes of gas boiler. We are proud to be Baxi Approved Installers and receive regular up to date training as part of this accreditation. Our engineers are Gas Safe registered which ensures we always work safely, efficiently and to current regulations. Call us on 01204 408707 or request a free quotation online. Need a Professional Gas Safe Plumber in Chorley? 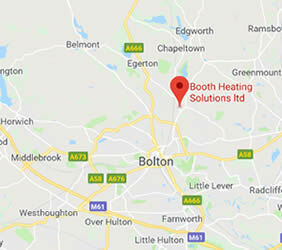 Booth Heating Solutions are local plumbers in Chorley covering the local area as well as Bolton, Bromley Cross, Egerton, Edgeworth, Astley Bridge, Bradshaw, Harwood, Lostock, Horwich and Westhoughton but also Bury, Whitefield, Radcliffe and Darwen. We are a family run business with expertly trained heating engineers covering all aspects of home heating. All our work is fully guaranteed and covered by public liability insurance. Our reputation has been built on providing an outstanding plumbing and heating service in Chorley with most of our work being by recommendation. We can usually fix boiler breakdowns in one visit. Why Choose Us For Plumbing and Heating in Chorley? Our fully qualified Gas Safe plumbers in Chorley provide a wide range of plumbing and heating services for clients throughout the Chorley area. We have over 15 years experience and are Gas Safe registered so you can be assured of a quality job. There's usually no call out charges and our rates are very competitive. We are approved Baxi installers and have a wealth of experience in all aspects of plumbing and heating. Get a plumbing and heating quote online or call 01204 408707 to arrange a quote. If you are looking for a professional, fully insured and reliable plumber in Chorley call Booth Heating Solutions today!